A big help for our trip for we are using google map everytime. Its good to have internet anytime. Strong Internet connection. Complete this Klook activity to get 1%-10% of the activity cost back in free credits to use on your next booking. For example, book US$8.15 to get US$0.1 free credits. Connect with family and friends and tell them all about the exciting trip to Singapore without exorbitant roaming costs. 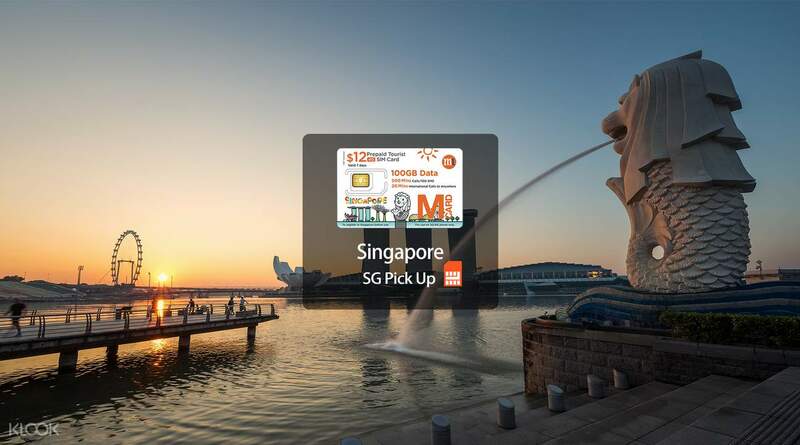 Conveniently pick up a Singapore prepaid SIM card at the airport and enjoy smooth connectivity for the duration of your stay in Singapore. Set up is fast and simple, so you can get connected immediately. Enjoy lightning fast web speeds, get updates from your social media accounts and make hassle-free travel arrangements brought to you from Mobile 1, one of Singapore's most popular and reliable service providers. Had to go to terminal 2 since there is no pick up location in terminal 1. But it didn’t give us a hard time to locate the convenience store. The sim is very convenient and reliable. It helps me stay connected to social media and navigate locations. The internet is very fast even when you’re in the subway. Had to go to terminal 2 since there is no pick up location in terminal 1. But it didn’t give us a hard time to locate the convenience store. The sim is very convenient and reliable. It helps me stay connected to social media and navigate locations. The internet is very fast even when you’re in the subway. the sim card is very good. line is strong and no hassle for setting. placed in sim card and it is useable! the place to get the sim card is easy to find. i googled the look of the convenient shop and managed to find it at the terminal where i arrived. will definitely get this sim again when i visit sg in the future. the sim card is very good. line is strong and no hassle for setting. placed in sim card and it is useable! the place to get the sim card is easy to find. i googled the look of the convenient shop and managed to find it at the terminal where i arrived. will definitely get this sim again when i visit sg in the future. Helped me stay connected to social media all the time! Also, help my family and I navigate the city! Had it picked up from the airport once we arrived. as usual, kudos to Klook for an efficient transaction! Helped me stay connected to social media all the time! Also, help my family and I navigate the city! Had it picked up from the airport once we arrived. as usual, kudos to Klook for an efficient transaction! Easy to find the claiming booth and east to use. Auto registered, just insert the sim in the phone or pocket wifi. East to use and high speed and up to 100GB of data allocation. Have internet connection in your SG trip to enjoy your travel experience. Check the photos, even I am in the nature, in the tourist spot or underground you can still use the internet. Thank you Klook for this experience. Easy to find the claiming booth and east to use. Auto registered, just insert the sim in the phone or pocket wifi. East to use and high speed and up to 100GB of data allocation. Have internet connection in your SG trip to enjoy your travel experience. Check the photos, even I am in the nature, in the tourist spot or underground you can still use the internet. Thank you Klook for this experience. It was our second time in SG and it was our second time to get this simcard from klook. Very hussle free .you can claim it with in the airport upon arrival.just open the sim pack and insert it the8n you will be god to go! You will be connected to the world again! It was our second time in SG and it was our second time to get this simcard from klook. Very hussle free .you can claim it with in the airport upon arrival.just open the sim pack and insert it the8n you will be god to go! You will be connected to the world again! I highly recommended to get sim card when you're in Singapore. the internet connection was so fast and it's very useful when it was your first-time to visit Singapore. you can easily locate places you want to visit especially if you do it your self. you can claim the sim at the arrival area. I highly recommended to get sim card when you're in Singapore. the internet connection was so fast and it's very useful when it was your first-time to visit Singapore. you can easily locate places you want to visit especially if you do it your self. you can claim the sim at the arrival area. It was easy to find. And the person who processed it was really fast with it. He gave clear instructions and we instantly did it before using the MRT. It connected pretty fast and the connection is great wherever we are. The phone we used it at can also be used as a hotspot without no issues, its still doing great in terms of reliable internet connection here in Singapore. It was easy to find. And the person who processed it was really fast with it. He gave clear instructions and we instantly did it before using the MRT. It connected pretty fast and the connection is great wherever we are. The phone we used it at can also be used as a hotspot without no issues, its still doing great in terms of reliable internet connection here in Singapore. Q: Can I use this SIM card in Malaysia? A: No, this SIM card can only be used in Singapore. Please purchase this WiFI & SIM Card for Malaysia.